If you’re going to visit an English coast, you may as well head to a beach which typifies the English seaside – that's a beautiful rugged coastline, a stunning green landscape, wide, clean sands and crashing waves that are perfect for surfing. 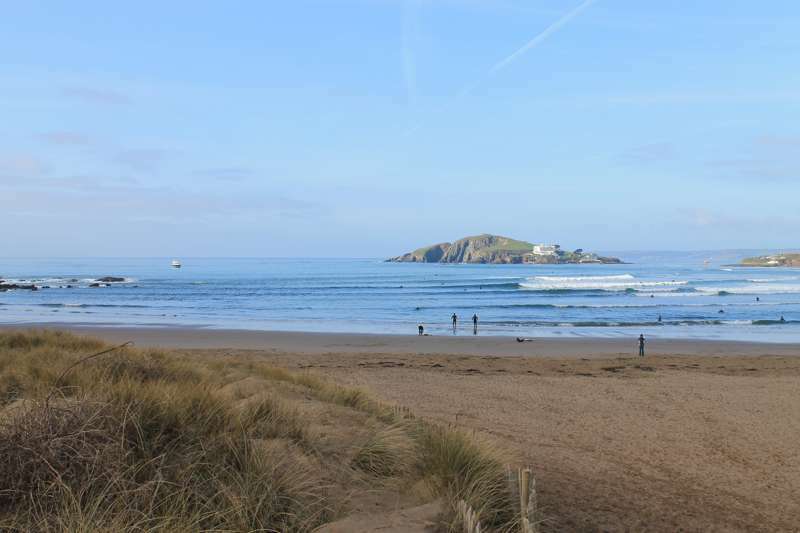 You’ll get all of that at Bantham Beach and that’s exactly why it is one of most popular destinations in South Devon. Although privately run (you have to pay to park here), Blackpool Sands is open to all and is clean, has lifeguard patrols and doesn’t allow dogs in the summer months. The vast array of trees, rocks and cliffs make it one of South Devon's most sheltered beaches, but it still receives plenty of sun and sea breeze. You can either take a stroll along the warm shingle beach, or hire a boogie board and wetsuit and dive into the blue. There are showers and a sand pit (yes, really) and if the sun’s out, it’s a pretty idyllic family beach experience. As soon as you approach North Sands, you’ll instantly notice the beautiful views of the Salcombe Estuary and Sunny Cove on the East Portlemouth side. The backdrop, meanwhile, includes the tiny ancient ruins of Salcombe Castle, which is known locally as Fort Charles. There is plenty you can do here – let your dog run free, swim in the calm waters, or sunbath on the soft sand. It's an easy level walk from Salcombe town along Cliff Road (about 15 minutes) and, owing to the safety of the bay and the intriguing rock pools, is popular with families. Despite Hope Cove being a relatively small stretch of beach, it’s still an extremely popular destination. In fact, it’s the size which gives it that romantic charm, and the old fishing port vibe has still been retained even as the village has evolved. When the tide is high, the beach is completely submerged, but fear not, because the coastal path is a marvellous alternative to sunbathing and sandcastle building. A rocky, wild, jagged coastline is something that you’d associate with South Devon and that’s where Lannacombe Beach draws its beauty. On one side you have Start Point, on the other side is Prawle Point, and in between you have a luxurious strip of lovely sand. Be warned, it is a popular spot and the car park is quite small, so remember to set your alarm nice and early! South Milton Sands is literally the epitome of family-friendly; the spacious stretch of powdery sand is cared for by the National Trust, the sea is calmed by the long headlands, and there’s a multitude of rock-pools to keep the little ones occupies for hours! Plus, when you all get hungry and thirsty, the Beachhouse Café is just seconds away, so you’ll be able to get back to beach in no time at all. If you’re into nature, taking a dip in the sea, and wartime history, then Slapton Sands could be the best option for you. The shingle beach (a contradiction in the name) leads into beautiful blue waters, and features a Sherman Tank memorial, commemorating the lives of US servicemen killed during D-Day landing practice. As for nature – Slapton Ley Nature Reserve is located just behind, and includes a massive natural lake, woodland and wildlife. For those that would prefer a quieter, more peaceful beach day in South Devon, you may want to try out East Portlemouth. It’s accessible by car (much longer), ferry or your own boat, and once you’re there, you’ll have access to three fabulous sandy beaches – Fisherman’s Cove, Smalls Cove and Mill Bay. If the tide is high, then a coastal walk could offer you amazing scenery and gorgeous views, but when the tide is low, you’ll be able to head down to the beaches! As you head down the steep path that leads into a secluded cove, you’ll venture through vibrant flora and deep woodland. The cove itself is enclosed by cliffs and trees, and that’s what makes Watcombe Beach an ideal spot to relax, wind down and maybe even take a snooze. On the beach, you’ll be able to find a café, toilets and lifebuoys. Alongside Meadfoot Beach itself, you’ll find a lengthy promenade with its cluster of colourful beach chalets and an array of deck chairs scattered about. There isn’t an abundance of sand, but there’s plenty of room to hitch your own chair and absorb the sun, as well as all the beautiful views.